190 Marlborough is located on the south side of Marlborough, between Dartmouth and Exeter, with 188 Marlborough to the east and 192 Marlborough to the west. 190 Marlborough was designed by Sturgis and Brigham, architects, and built in 1881 by Charles H. Dodge and B. D. Whitcomb, builders, as the home of Dr. Russell Sturgis, III, a physician, and his wife, Anne Outram (Bangs) Sturgis. They previously had lived at 31 Hereford. He is shown as the owner on the original building permit application, dated May 16, 1881. Russell Sturgis, III, was the nephew of John Hubbard Sturgis of Sturgis and Brigham. Russell Sturgis, III, purchased the land for 190 Marlborough on May 5, 1881, from attorney Peleg Whitman Chandler. It was the eastern part of a larger parcel Peleg Chandler had purchased on May 15, 1872, from the Commonwealth of Massachusetts. 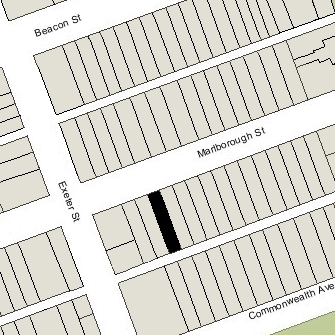 Click here for an index to the deeds for 190 Marlborough. 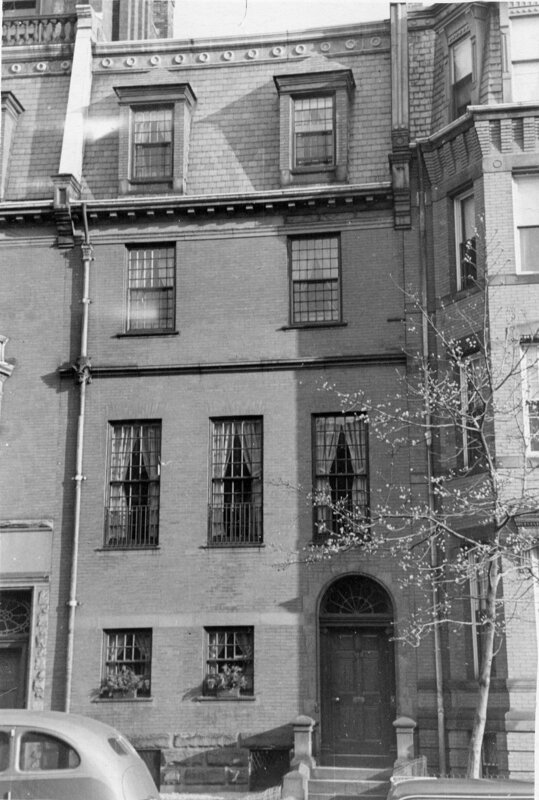 As originally built, the house had an oriel window on the second floor, similar to the one at 188 Marlborough (also designed by Sturgis and Brigham and built in 1884). Sometime between 1917 and 1928, the oriel window at 190 Marlborough was removed and windows on the first floor were redesigned. 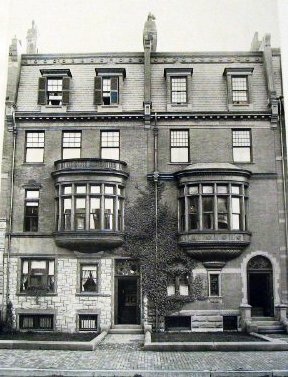 Russell and Anne Sturgis continued to live at 190 Marlborough during the 1894-1895 winter season, but moved soon thereafter to 44 The Fenway. On June 15, 1895, 190 Marlborough was acquired from Russell Sturgis by Arthur Theodore Lyman, a cotton manufacturer and wholesale merchant. He was a widower, his wife, Ella Bancroft (Lowell) Lyman, having died in March of 1894. He lived at 39 Beacon and in Waltham. 190 Marlborough became the home of Arthur and Ella Lyman’s son-in-law and daughter, Dr. Richard Clarke Cabot and Ella (Lyman) Cabot, who had married in October of 1894. Richard Cabot was a physician and professor of social ethics at Harvard University. He also established the Social Service Department at Massachusetts General Hospital. He maintained his medical office at 190 Marlborough. The Cabots continued to live at 190 Marlborough during the 1912-1913 winter season, but moved thereafter to 1 Marlborough. On May 21, 1913, 190 Marlborough was purchased from Arthur T. Lyman by Anna Dummer (Anderson) Bangs, the wife of attorney Francis R. Bangs. They also maintained a home in Nahant. On August 15, 1928, Anna Bangs transferred the property into both of their names. They continued to live at 190 Marlborough in 1935. During the 1935-1936 winter season, they were living elsewhere and it was the home of Charlotte Howe (Johnson) Guild, the widow of Governor Curtis Guild, Jr. She previously had lived at 144 Marlborough. She continued to live at 190 Marlborough until her death in April of 1936. By the 1936-1937 winter season, the Bangs were living at 190 Marlborough once again. They continued to live there in 1938. On August 22, 1938, 190 Marlborough was purchased from Francis and Anna Bangs by Harris (Harry) Adolph Goller, a salesman, and his wife, Mabelle Elsa (Miller) Goller. They previously had been lodgers at 118 Marlborough. In September of 1938, John Sjodin, who had bought 188 Marlborough at about the same time, filed for (and subsequently received) permission to convert both 188 and 190 Marlborough from single-family dwellings into lodging houses. In 1940, he acted as agent for Constance Worcester to convert her family home at 186 Marlborough into a lodging house. Harris and Mabelle Goller lived and operated the lodging house at 190 Marlborough. He died in February of 1946, and Mabelle Goller continued to live there and operate the lodging house until about 1948. On June 1, 1948, 190 Marlborough was purchased from Mabelle Goller by Mrs. Edna Mae (Reynolds) Candage Lovejoy Walsh Grant. She was the former wife of Henry (Harry) Wells Candage, the widow of Everett John Lovejoy and Dr. William Martin Walsh, and the former wife of Wallace Edwin Grant. On November 15, 1951, Edna Grant transferred 190 Marlborough and her other properties to a trust she established for her benefit with Anna Louise (Day) Hicks as trustee. On December 1, 1952, 190 Marlborough was acquired from Anna Louise (Day) Hicks by Edward G. Post and his wife, Frances (Linwood) Post. They lived in Jamaica Plain. On September 5, 1956, 190 Marlborough was acquired from the Posts by attorney Lawrence W. Sabatino and his wife, Jessica Sabatino. They lived at 347 Charles. On June 15, 1958, 190 Marlborough was acquired from the Sabatinos by architect Robert Bradley Cutler and his wife, Claire (called Peter) (Demmer) Cutler. They previously had lived in Manchester. In January of 1959, he filed for (and subsequently received) permission to convert the property from a lodging house into two apartments. They continued to live there until about 1962. On June 1, 1962, 190 Marlborough was acquired from the Cutlers by Duncan Cotting, a wholesale butcher, and his wife, Marjorie Clare (Lynds) Cotting. They lived in one of the apartments. The previously had lived in Newton. On January 7, 1964, 190 Marlborough was acquired from the Cottings by Robert M. Light, an art dealer specializing in rare prints, and his partner, Donald Graham Outerbridge, a painter and photographer. They previously had lived at 421 Beacon. In July of 1974, Robert Light filed for (and subsequently received) permission to remove a bow window on the rear façade and construct a greenhouse/conservatory room in its place. They continued to live at 190 Marlborough in 1977, but had moved to Montecito, California, by 1978. On December 28, 1977, 190 Marlborough was purchased from Robert M. Light and Donald G. Outerbridge by Peter E. Walker, a landscape architect. On June 20, 1980, he transferred an undivided half interest in the property to his partner, Martha Schwartz, also landscape architect. On February 13, 1984, Joecephus Brewster purchased 190 Marlborough from Peter Walker and Martha Schwartz. That same month, he filed for (and subsequently received) permission to convert the house from two to three units. 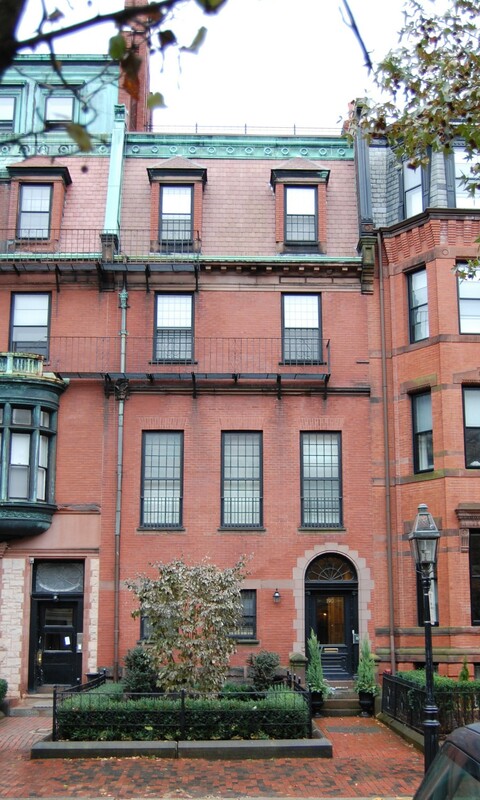 On January 2, 1985, he converted the property into three condominium units, the 190 Marlborough Street Condominium.